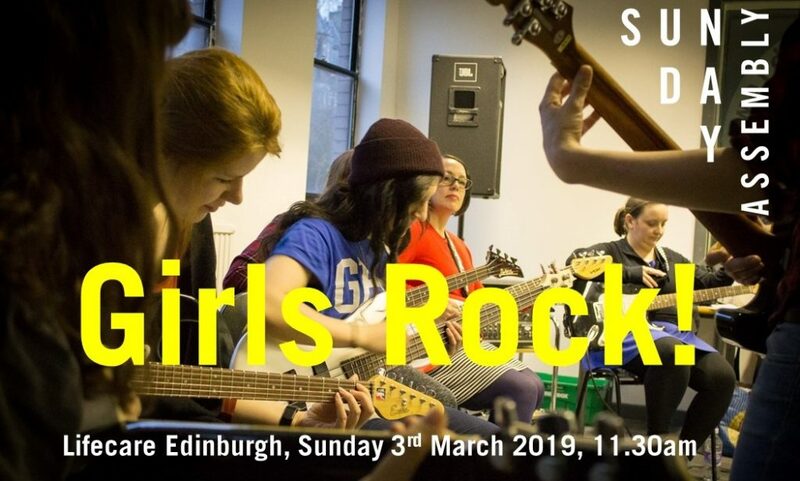 Our March Sunday Assembly promises to be a rockin’ good time; our speaker Fiona Watt leads Girls Rock School Edinburgh. GRSE was started up by local women musicians as a non-profit organisation running free music workshops for all women and transwomen regardless of age or ability, to learn guitar, bass, drums and vocals in a relaxed, informal, supportive way. GRSE aims to increase the number of women musicians, to inspire other women and girls following them to do the same – making women in bands the norm rather than the exception! Come and hear what inspired the project, and how its mission to build the self-esteem of women and girls through music creation and performance has fired up and turned around the Edinburgh live music scene! Fiona sings in just about every choir in Edinburgh. She fronted post-punk band Vatican Shotgun Scare in the 90s and currently plays bass in Suffrajitsu, a GRSE graduate band. And she’s also a Sunday Assembly regular. We will also have the usual mix of poetry, songs to sing, reflections, community and cake. Sunday Assembly is Edinburgh ‘secular congregation’. We are family (and dog) friendly, fun and free to attend. Join us at Lifecare Edinburgh, 2 Cheyne St, Stockbridge EH4 1JB to celebrate life!